After moving from Beijing to the US, one of the things I’ve missed most has been the breakfast. The freshly made hot soy milk (豆浆) and the crispy, fluffy fried dough sticks (油条) are the best best combo to start a day happy. One of the most famous all-day breakfast chains – Yung Ho Dou Jiang Restaurant – has “soy milk” in its name. So you can imagine how important this morning staple is for Chinese people! In my parent’s home, the soy milk maker sits right next to the rice cooker. My mom always used it 2 to 3 times a week to make fresh soy and multi-grain milk. 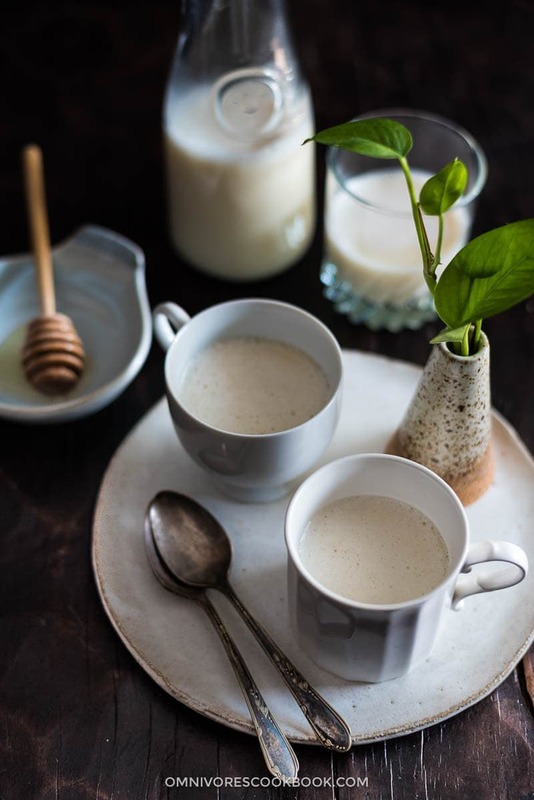 Compared to the stuff you buy from the supermarket, homemade soy milk does not contain additives, and you can adjust the sweetness by using less sugar. 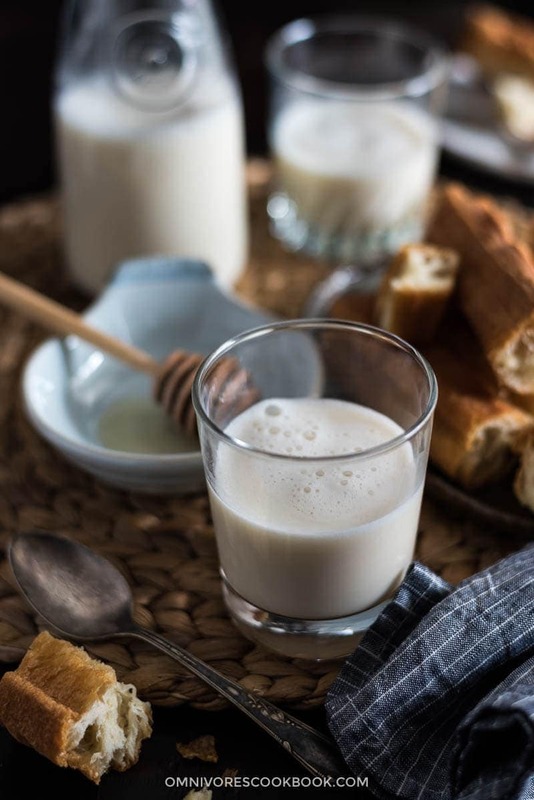 The fresh and fragrant taste of homemade soy milk is something that manufactured versions cannot get anywhere near. Since I moved to the US, I started off just drinking boxed soy milk. One time I left an opened carton in the fridge and completely forgot about it. To my biggest surprise, it was not spoiled and still tasted fine after sitting in the fridge for more than a month…. when it really shouldn’t last more than a few days! That’s when I decided I needed to eliminate all plastic- and paper-packaged milk and start making my own. Why use a soy milk maker? 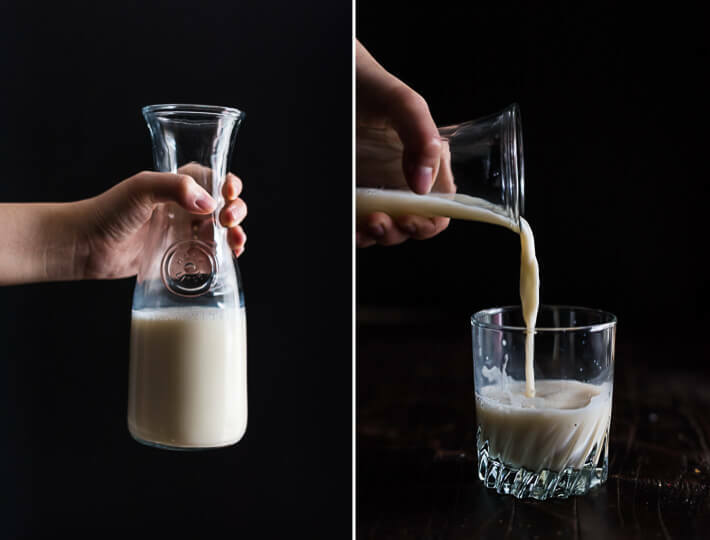 Yes, you can always make soy milk without a soy milk machine – I used to do it before I purchased my soy milk maker. 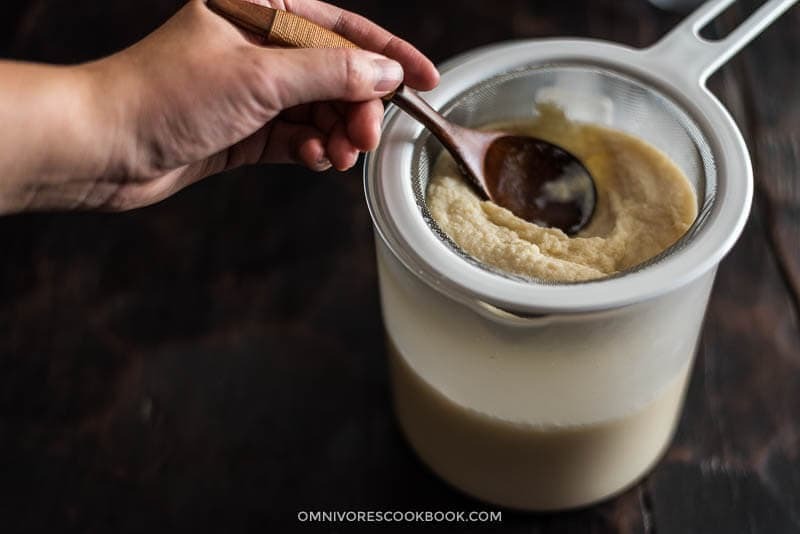 But if you enjoy drinking soy milk (or other plant-based milk) on a daily basis, the complicated cooking process might not be very practical. How do I use a soy milk maker? I was so happy when I found Joyoung Soy Milk Maker on Amazon; it’s the same brand that my mom uses. 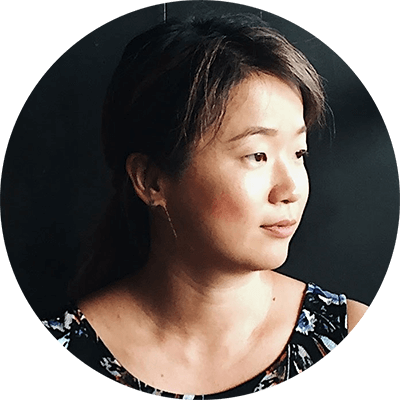 Joyoung is a famous Chinese home appliance maker and owns the largest market share for its soy milk machine – so I made the purchase without a second thought. The soy milk maker comes with two parts. A body that is plastic on the outside and stainless steel inside, and has a lid with a heating element and a blender attached. When you close the lid and plug in the cord, you’re basically done with setting up the machine. There are a few other things that come with the package. That’s it! It only takes like 3 minutes to set up and then you can forget about it. Once the machine beeps again, you will have a pot of freshly made soy milk! Here we need to do one more step to make the milk more smooth – strain the milk through a fine mesh. This process will remove most of the bean pulp, which you can save and use for cooking pancakes (see recipe below). I enjoy my soy milk hot with a little syrup, the same way we do in China. But if you prefer your soy milk cold, you can always cool it off or add ice cubes. I like to store leftover soy milk in mason jars. Once I finish making a batch of soy milk, I always to wash the machine immediately while it’s warm, so the bean pulp residue comes off easily. Alternatively, you can fill the machine with hot water and place the lid back on to soak it before you’re ready to wash. Most recipes will tell you to throw it away, which is a massive waste. 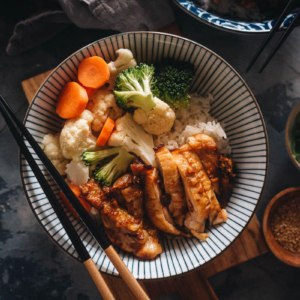 The bean pulp, or kara in Japanese, contains high dietary fiber and calcium and is abundant in protein, carbohydrates and potassium (according to the Japanese Tofu Association). 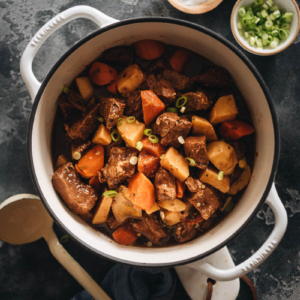 This bean pulp has a coarse texture that isn’t particularly pleasant if you eat it directly, so you’ll want to use it with other ingredients to alter the texture. 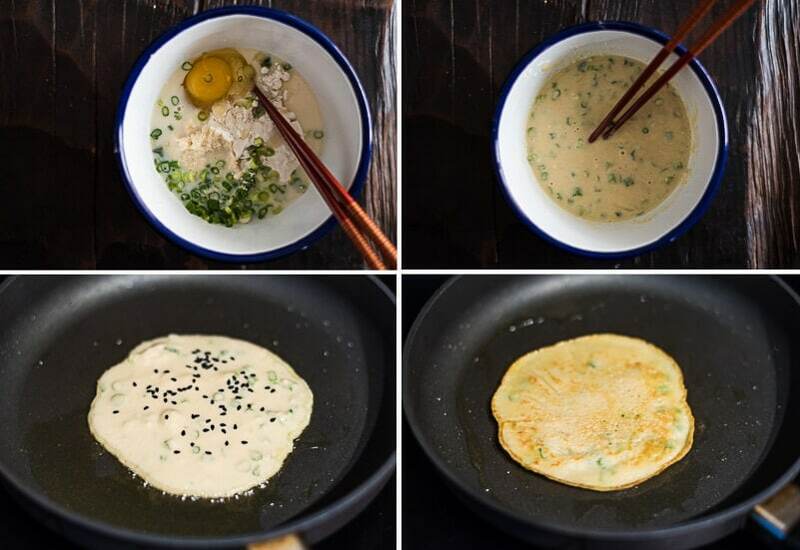 My favorite method is to mix the pulp with egg and flour to make green onion pancakes. It takes 10 minutes to whip this together and then you have a full breakfast! 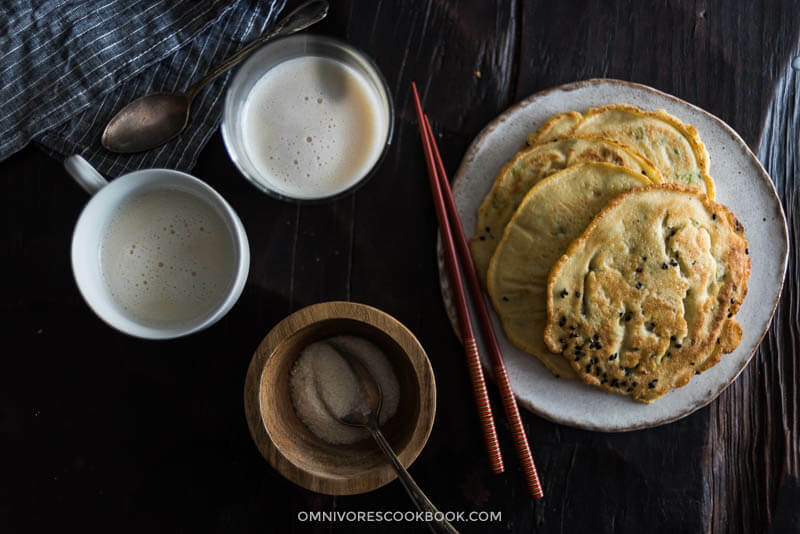 You can see the full okara pancake recipe right next to the homemade soy milk recipe below. Since I got my soy milk maker, I’ve been making plant-based milk 2 to 3 times a week because it’s unbelievably easy! 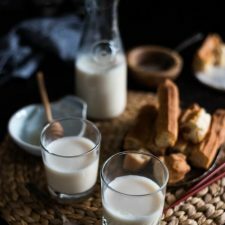 Homemade soy milk is a great snack that I drink in the morning, with dinner, or during the day. I like the fact that it keeps my stomach satisfied and my body hydrated. What is your favorite plant based milk? Leave a comment below to share your thoughts! Please note, the prep time doesn’t include soaking the beans. 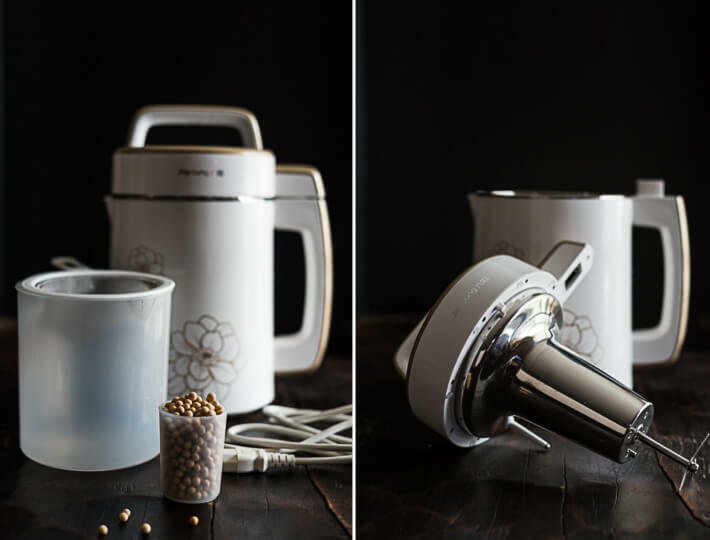 Use the soy bean cup that comes with the machine to measure 1 and 1/2 cup dried soy beans. Add into a bowl. Rinse with tap water for 1 to 2 times to remove dust on the surface and drain. Add water to cover the beans at least 1-inch deep. (Cook with soaked beans) Soak the beans overnight or for at least 6 hours. 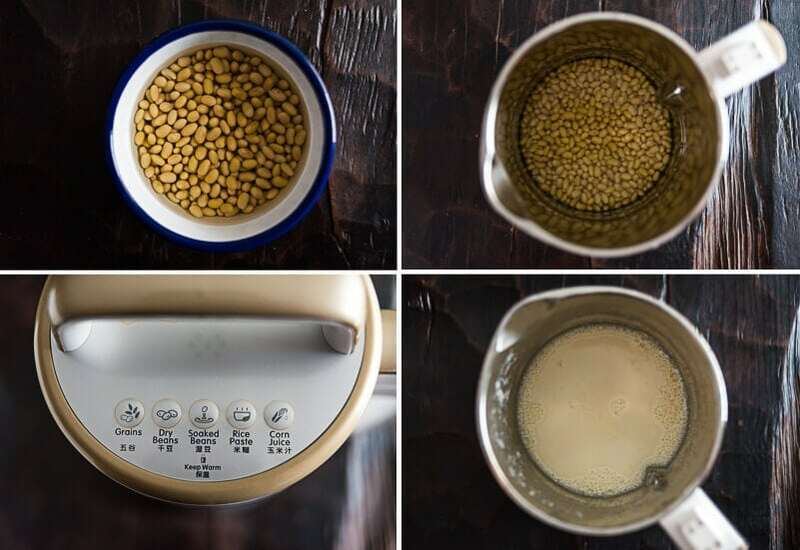 Drain the soaked soy beans and add to the soy milk maker. Add filtered water until it reaches the 1700ml mark. Place the lid of the soy maker on and adjust so it’s firmly attached. When you plug in the cord, you should hear a beep and the soy maker shows “Keep Warm” on the lid. This means you’ve set up the machine properly. Choose “soaked beans” and you will hear two beeps. This means the machine has started. Soon after you start the machine, you will hear a loud noise for a few seconds, which means the machine has started to grind the beans while heating up. Now your job is done and you can relax. A big jar of freshly made soy milk will be ready in 30 minutes. During that time, you will hear the machine mixing from time to time; the noise is about same level as your blender. Once the soy milk is done, the machine will beep for 1 minute and automatically switch to “keep warm” for an hour. Please note, you should not leave the hot soy milk in the machine for more than 4 hours. Place the fine mesh over the jar that comes with the machine (*Footnote 2). Pour the soy milk into the jar to remove the soy pulp. You can use a small spoon to stir and press the soy pulp, so it speeds up the process and lets the milk drain thoroughly. Now the soy milk is ready to drink. You can enjoy it hot or cold. My favorite sweetener is agave nectar or maple syrup. If you feel the bean flavor is too strong, adding one to two drops of vanilla extract will even it out a bit. To store the milk, let it cool to room temperature, then transfer to airtight jars. Store in the fridge for 3 to 4 days. The soy milk made with dry beans tastes almost as good as with soaked beans. However it generates a very fine bean pulp that is difficult to remove using the fine mesh, so the milk is not as smooth as a result. You can strain the milk first and let sit for a while. The bean pulp will sink to the bottom; then you can pour the milk into glass without pouring the bean pulp. The jar is plastic. I always let the the soy milk cool down for a bit before draining. If you do not like pouring hot liquids into a plastic jar, you can use a ceramic bowl instead. Whisk everything in a big bowl until it just form a runny smooth paste. Do not mix too fast or over mix, which develops gluten and will yield tough pancakes. Heat a nonstick pan with 2 teaspoons oil until hot. Add 1/4 cup pancake mixture and gently shake the pan to form a round pancake. Cook until the bottom set, 30 seconds to 1 minute. 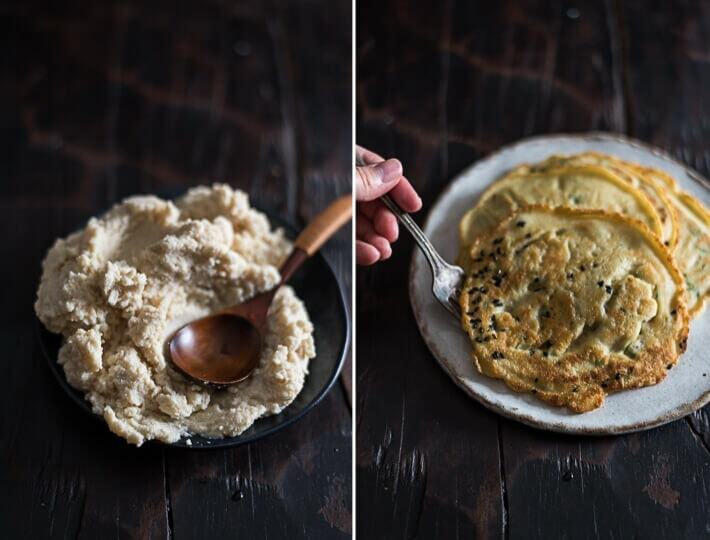 You can add a small pinch of black sesame onto the pancake, if using. Flip to cook the other side until the pancake just set, for another 30 seconds. Transfer to a plate and cook the rest pancakes by using the same method. NICE!! I would typically file soy milk under “things I buy” versus “things I make”. Thanks for shifting my thought on that – this looks amazing! I am SO impressed! You recycled the kara and made it into scallion pancakes that is more healthy for you! 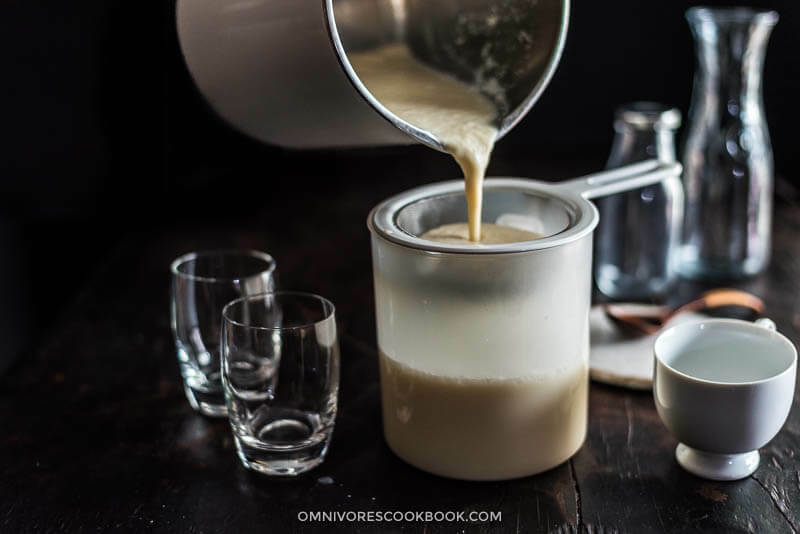 Thank you so much for this recipe and introducing the soy milk maker. I will consider buying one, because I would love to make my own soy milk for the very reasons you explained. I found an asian market that sells dried soybeans the other day. Hi Pey-Lih, I’m glad to hear you’re interested in the recipe and trying out the machine. My family really love soy milk so I’ve been making many times a week. If you drink it frequently, it’s definitely a great investment. 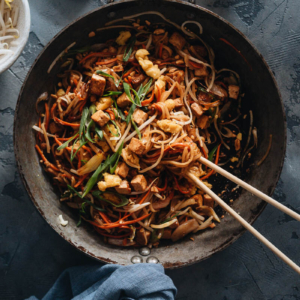 Plus, you can make tofu at home as well! I have this soy milk maker. I purchased it to make home made tofu but I have been so unsuccessful for over a year now. I really need help on how to use the soy milk from this Joyoung to make tofu. Can you help? one thing I couldn’t figure out is how to get rid of those “Beany taste” in homemade soy milk (not via machine). it’s kind of bitter taste left in your throat after drink down. I soaked them 24 hours and took off bean skins and washed and raised multiple times—didn’t help. I blend them after soaking and cook about 30 min. and sequeeze the milk out. 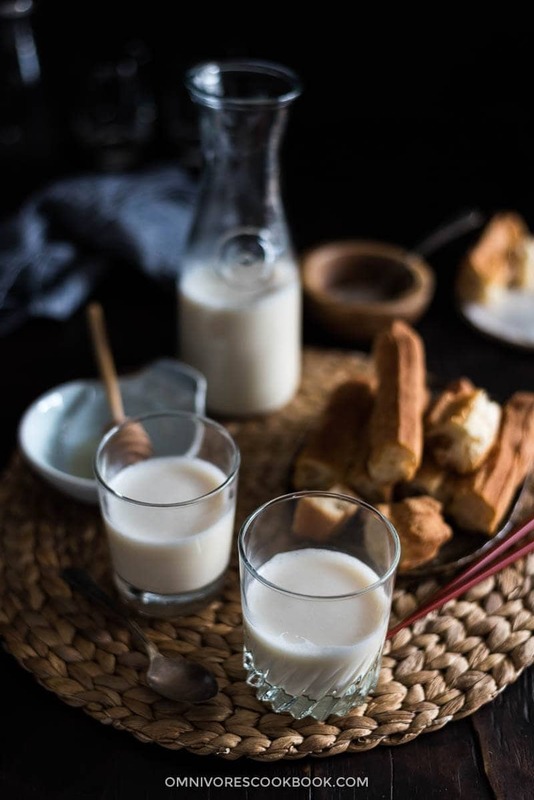 What is the Chinese old folk way to make tasty milk without those unpleasant taste? I don’t like machine as it doesn’t really taste like milky because it’s not coming out from pressure. Hi Linda, hmmm, I’ve never really had the bitter taste when drinking the homemade soy milk. It is quite a bit beany, but it is not in a pleasant way. Nowadays I mostly cook directly from dry beans. I’ve seen other recipes (without machine) indicate that you should press the milk first before cooking it. Have you tried it? Some readers mentioned that adding a bit cinnamon and nutmeg will be helpful to eliminate the beany taste. And always sweeten your milk, even just for a bit. It will be helpful too. This post is extremely helpful. I just received the Joyoung soy milk maker today. The instructions do not translate well to English. This clarifies many things for me. Thank you. Of course, now I am curious about rice paste. What do you do with rice paste? Hi Laura, I’m glad to hear you found my post helpful! The rice paste is more like a blended congee, which we sweeten with sugar and serve as a snack. I know it does not sound so appetizing, but it tastes way better than it looks. The translation is a bit off. I think it’s closer to “rice smoothie” or “rice soup”. The one I like the most is the black sesame, which was a snack I ate growing up. If you’re curious, check out this recipe: https://omnivorescookbook.com/recipes/breakfast-smoothie-with-walnut-peanut-and-rice It is a very close thing to the “rice paste”, with a rich nutty flavor when you add the nuts. I made it a long time ago before I purchased the soy milk machine. I just bought the Joyoung soy milk maker and made my first batch of soy milk last night using your instructions. Thank you for your helpful page! I made the pancakes this morning, but using the recipe, my batter was extremely dry and crumbly. I wonder if my okara wasn’t as liquidy? My fiance really went to town trying to filter every last drop of milk out of it haha! Although not listed on the ingredients, did you add soy milk or water to the recipe? I ended up adding 1/4 cup soy milk and 1/4 cup apple sauce to make the flour:liquid ratio closer to 1:1. They turned out pretty good but still thick. Any suggestions? I enjoyed them with soy sauce, and my fiance used ginger syrup. Thanks, and I look forward to exploring your page more! Hi Ashley, I’m glad to hear the post was helpful! As for the okara pancakes, I do remember they are on the drier side. I needed to use a bit more oil to obtain the crispy texture. Yes I did add soy milk to the pancake batter. So sorry I forgot to mention it in the recipe! The amount depends on the dryness of the okara, but at the end, you should add enough liquid to make a rather runny batter. I just got one of these machines and was wondering if you have or can make other plant based milks in it? My husband is allergic to soy. Hi Jane, yes, you can totally make other types of plant-based milk and the method stays the same. I have a Joyoung soy milk maker too but the capacity is not as big. Mine has a capacity of 1300 ml. Do you think that the little measuring cup that comes with the soy milk maker is smaller than Yours? Should I still measure 1.5 cups of beans? I’ve been weighing 90g on my scale but am tired of pulling it out Everytime I make soy milk!